We gather for a meal on this night to recall the Passover meal Jesus shared with his disciples, a meal that would, for Christians, become the Eucharist. We also remember the commandment of Jesus to show our love for one another through lives of service to one another. 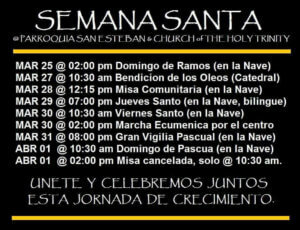 This meal and liturgy are also an opportunity for members of the Holy Trinity and San Esteban communities to eat and worship together. Esta noche, nos congregamos para una comida en común, para rememorar la cena de la Pascua que Jesús compartió con sus discípulos, una comida que, para los Cristianos, se convertiría en la Eucaristía. También recordamos el mandamiento de Jesús de mostrar nuestro amor mutuo por medio de vidas de servicio de los unos a los otros. Esta comida y esta liturgia también son oportunidades para que los miembros de las comunidades de Holy Trinity y San Esteban para comer y adorar en común. The walk begins and ends at the Church of the Holy Trinity and the crowd moves as a procession to stations around the city within walking distance, each set with a different aspect of the theme. 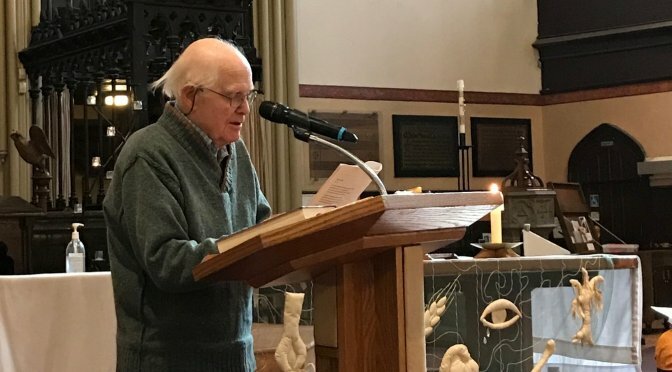 At the end of the walk, back at the church there is a short reflection followed by a light meal of soup and bread. In English. 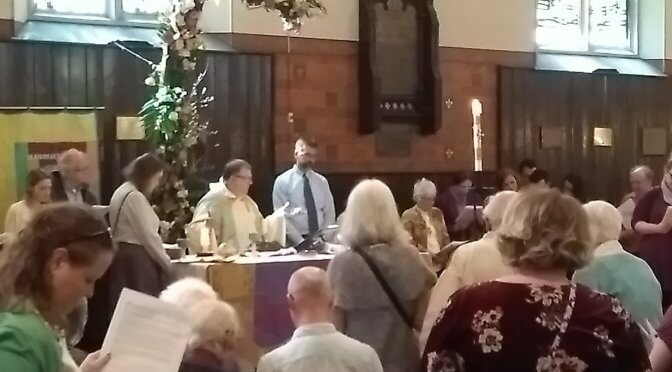 A service in four parts: The Word, The Light, Renewal of Baptismal Vows, and The First Eucharist of Easter. Fire, water, rebirth, celebration, and thanksgiving! Bilingual in English and Espanol. 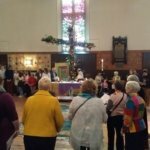 Un servicio en cuatro partes: La Palabra, La Luz, Renovación de los votos bautismales y La Primera Eucaristía de la Pascua. ¡Fuego, agua, renacimiento, celebración y acción de gracias! Bilingüe en inglés y español. Happy Easter! Rejoice with us in a bilingual English and Spanish service. 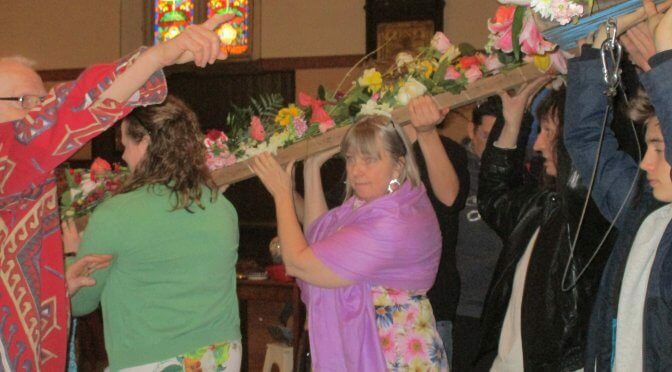 Bring flowers if you have them for the flowering of the cross. Stay afterwards for a community feast all are welcome to join! ¡Felices Pascuas! Regocíjate con nosotros en un servicio bilingüe de inglés y español. 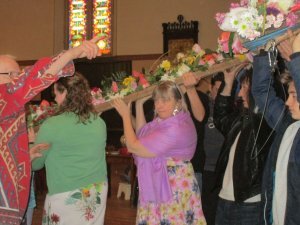 Trae flores si las tienes para el coronación de la cruz. ¡Quédate después para una fiesta comunitaria, todos son bienvenidos! 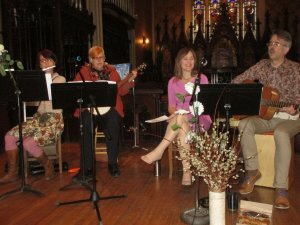 On Sunday, April 1, we gathered as a community to celebrate Easter. 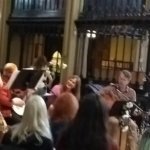 We flowered the Cross, sang, listened to scripture and held a community feast. These photos were taken by our caretakers and Vivian Harrower. 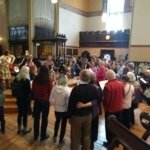 We gather in a circle to share communion with each other. 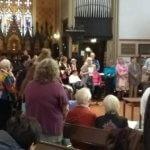 Each year we sing Stan Rogers’ classic, “The Mary Ellen Carter” at the close of the service. 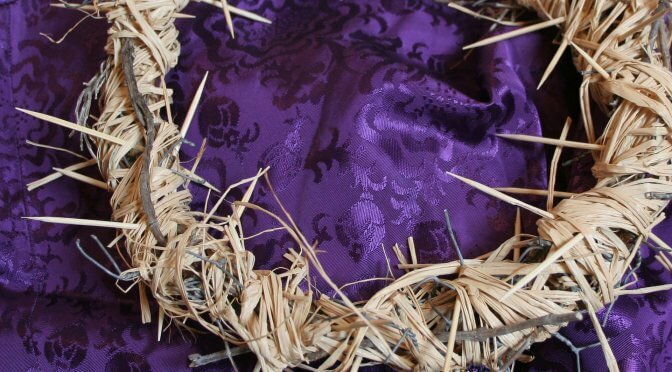 PALM SUNDAY: March 25 10:30 a.m.
MAUNDY THURSDAY: March 29 6 pm: Supper, handwashing intertwined into the service. In English/Espanol. 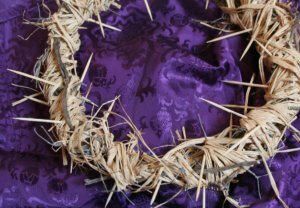 GOOD FRIDAY: March 30, 10:30 a.m. An English language service. THERE IS NO SEPARATE SPANISH LANGUAGE SERVICE TODAY. 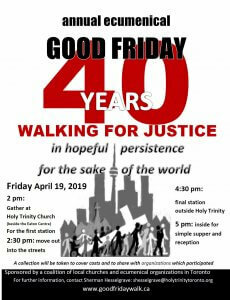 Ecumenical Good Friday Walk for Justice: March 30 at 2:00 PM, starting at Holy Trinity. GREAT VIGIL OF EASTER: March 31, 8 p.m. A bilingual English/Espanol service. 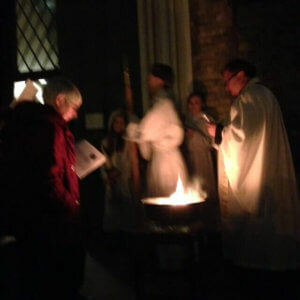 This service includes Biblical readings, the Litany of the Saints, the lighting of the Paschal Fire and a service of light, remembering our baptismal vows, and the First Eucharist of Easter. Young people and families are active in the leadership of the service. 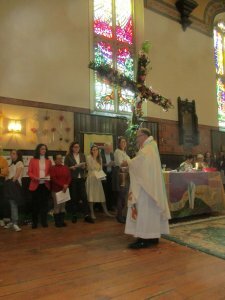 EASTER DAY: April 1, 10:30 a.m. with Feast and Flowering of the Cross. A bilingual English/Espanol service. 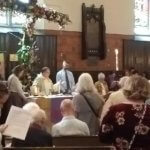 We will flower the cross and share the Eucharist followed by a celebratory lunch and Easter Egg Hunt. Please feel free to bring flowers to adorn the cross. 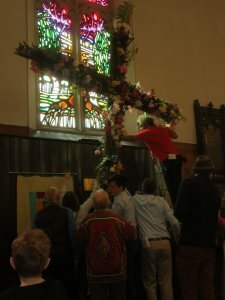 What does it mean to our parishioners to flower the cross? Find out in the videos below! 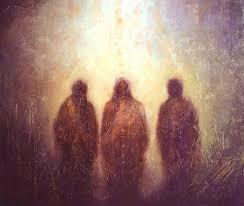 +In the name of God our Maker, Jesus Living, and the Fulfilling Spirit, Amen.